Uh-oh! Mercury is in retrograde! Go ahead and put out a disclaimer to everyone in your life by saying that you may or may not mean the things that you say and therefore you should not be held liable 😉 I know I am definitely feeling the effects of Mercury being in retrograde, however I feel there is a deeper message in the emotions that have arisen in light of the retrograde. In the last two weeks I have completely reevaluated myself. I am blithely aware of the fact that I have been struggling to find the balance in not only my life, but within me. I keep bouncing back between two realms of myself. One is superficial and one is my essential being. I often don’t realize I am living in a superficial facade of myself until I am unhappy and in a state of “need”. Then I realize that I have deprived myself of spiritual wellness; I haven’t fed my soul, I am parched for the knowledge of the universe, I am lonely for the affection of spending time in nature, I am tired and need stillness in my mind. And because I have deprived myself of these things, I have lost myself. Every human being needs to understand the basic relationship between themselves and the universe. Knowing this helps you to gain insight into yourself and the universe. From this knowledge, success, happiness, and peace are born. Change is brought about by 2 qualities: Attention and Intention. Attention energizes and Intention transforms. If you focus your attention on something, it will grow stronger and vice versa. Intention on the other hand, triggers the transformation of that energy. So what is the difference in our energy and information? The way we process it. As humans, we have a nervous system that is capable of becoming aware of the energy and information we are processing. We experience this information subjectively (thoughts, emotions, etc) and objectively (physically). Not only that, but we are able of consciously changing the information we process. We can pick and choose what informational content we process and therefore change the energy and information in our own quantum field. Our bodies are not separate from the universe. We are nothing but a localized disturbance in the larger quantum field. The larger quantum field-the universe-is our extended selves. So now that we know our connection to the universe and the 2 qualities of change (attention and intention), how do we put them to use? Well intention and attention go hand in hand, attention is the seed and intention is the fertile ground. Because these 2 qualities go together, they have “infinite organizing power”, meaning the power to organize infinite space-time events all at the same time. This happens every day in our lives. It is how our universe works. Everything that is alive came about from infinite organizing power or simply through the timing from the universe (the cells in our body, reproduction, a blooming flower, etc). In nature, everything correlates and connects with everything else, so this is where trust comes in. You have to trust in the timing of the universe. Nature is a symphony. Knowing this, you can use this information to make the infinite organizing power work for you. Introduce your intention, relinquish any control you have over the outcome, focus it on the future, because your attention should be on the present moment. You must accept the present for what it is, that shows your trust in things happening as they should. It shows your flexibility with life and your relinquishment of control. Your point of power is in the present moment. Ever notice how when you are completely involved in an activity (work, working out, hanging with friends, etc) and you are completely consumed in the present, things seem to just flow in your life more naturally than when you are stagnant daydreaming about the future or reminiscing about the past? The past and present do not exist and they are still being born in the present moment because you are creating them in your present moment through your thoughts; robbing yourself of precious time in the real-time present. Your ego loves focusing on the past and future, but you are not your ego. Your ego is responsible for emotions like jealousy, anger, embarrassment, insecurity, etc. Ever notice when you think a thought and you answer yourself? It is like you are observing your own thoughts. Well who is the person thinking those thoughts and who is the person observing them? It is your ego and your essential being; learn to disconnect with your ego, refusing to feed into its drama. Now, you can always create your future through detached intention (no attachment to any one thing, person, or outcome), but you should never struggle against your present. This is the hardest for me. I constantly do this and once I do, everything else starts to get worse and the whole “when it rains it pours” saying becomes very real for me. I am sure the same can be said for you. This is because when you struggle or resist your present, you are resisting the whole universe. The past, present, and future are all properties of consciousness. The past is recollection or memory and the future is anticipation. The present is awareness. Time is movement of thought and past and future are born in the imagination, the only thing that is real is the present. When you stop putting restrictions of what you want the future to be like and having this dire attachment to it, you free it and it can then be created from the birth of your desires and intentions. Release it to the universe, trusting it will develop in the right time and in the right way. If you learn to harness the power of intention you can create anything you desire. Deepak Chopra says there are 5 ways of doing so: 1. Slip into the gap. This means to center yourself into the silent space between your thoughts (this takes practice!) 2. In that state of being, release your intentions and desires. 3. Remain in a state of self-referral (this is my favorite one). This means to remain established in the state of your true self-free from others opinions of you and criticism. Don’t look at yourself through the world’s eyes, stay true to your spirit. 4. Relinquish your attachment to the outcome. Live in the wisdom of uncertainty, enjoying the present moment and the journey of life, even if you don’t know the outcome. The present is a gift which is why it’s called the present. 5. 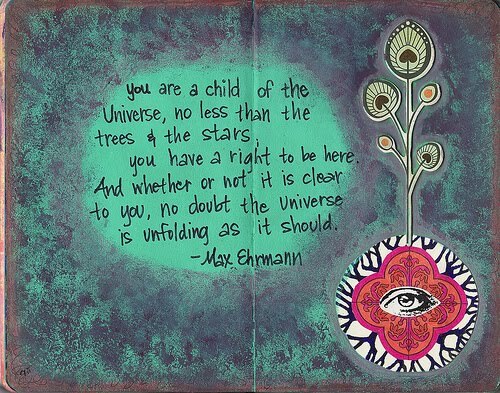 Let the universe handle the details. When you release your intentions and desires into the gap, they have infinite organizing power; trust the universe to orchestrate all the details for you. I have lived my life this way and I can attest to it working, but it is a commitment and with consistency, you see the best results. Whenever I stop living this way, I slip into a superficial lifestyle and I disconnect from my true self and remain in a state of unhappiness, no matter what’s going good in my life. 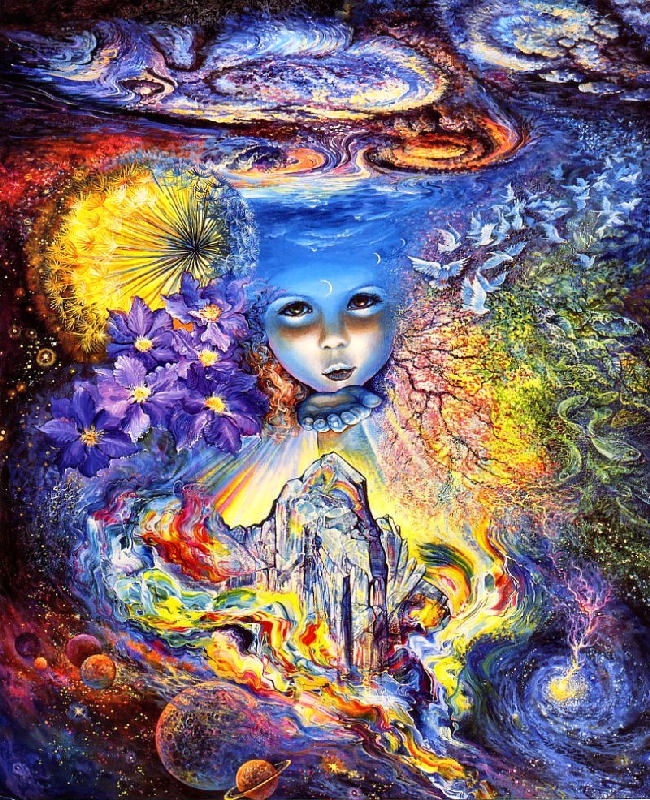 I feel it is our natural state of living, to live in harmony with the universe. Yes, we learn about the 5 senses in school growing up, but we have way more. We are spiritual beings in a physical world that is so complex. We experience things like intuition, love, empathy, deja vu’, and many other emotions and senses that we are unable to fully understand. We live in this majestic place, but we distract ourselves with unimportant man-made things, that often result in us feeling unsatisfied. There is nothing wrong with wanting materialistic things, wealth, a boyfriend/girlfriend, or whatever it is you desire, but you have to first acknowledge your true self and your true essence. The materialistic goods will never make you truly happy if you are not living in your essential state. In addition, your actions need to be motivated by love. If you are seeking wealth for personal gain only or for the sake of the ego, you cut off the flow of energy to yourself and interfere with expression of nature’s intelligence. Love is a universal language. Nature is held together by the energy of love, so acting from a place of love creates a conversation between you and the universe that is understood. I touched on the book, “The Seven Spiritual Laws of Success” by Deepak Chopra in a previous post and in this one too. I highly recommend any and every one to read it, you can buy the book here . There is a chapter dedicated to each spiritual law and Chopra is great at helping you understand how and why these are considered “laws of success”. It’s a quick read, you could probably read it in one day, or dedicate a chapter to one day a week and finish it in 7 days. Personally, it changed my life and I hope it has the positive affect on your life that it had on mine. Lastly, remembering that we are a child of the Universe, working in harmony with it, can help relieve the stress of those times in our lives when we don’t know what the hell we are doing. The universe wants to give us everything we desire, we just need to learn to communicate with it and listen to it. It’s one of the most important relationships that we will forever be working on. And even though you may not know or understand your present moment, say thank you for the gift of a beautiful day and cherish it. Nothing is that big of deal in the grand scheme of things. The only thing constant in life is change, so whatever you are going through, it is temporary…what comfort there is in that!